Play the Human Knot Game with your class. Depending on class size, either do the activity as one large group or break your class down to two teams and make it a competition. There are also several variations of the game, so choose the one that works best for you! Students love this game; it’s super fun and engaging! After the game is over, have teams or each team member answer the following questions and be prepared to discuss with the class. What skills did you utilize or need to accomplish your task? What did your team do well? What does your team need to improve upon? Ask students if they are familiar with the term “employability skills”. Ask them to define what they think it means in their own words. Share their ideas with their shoulder partner. Then ask student partners to have a Google Race, on the count of 3, to see who can use their device to look up an actual definition of the term. Count off and go…have the fastest person in each group stand. Once all groups are represented, ask them to share the definitions they found. Provide students with a copy of “Title These Employability Skills” and have them individually match up the headings for the skills characteristics. This chart was created based on information found at this website. Go over answers and then have them complete the questions that follow. If you are not 1:1, you will have to copy the web article and project the video clip on the screen for your students. Collect and correct this section. Pass the assignment back to students to use as a reference as they view the movie The Pursuit of Happyness and explain examples from the video that show how Chris Gardner exemplifies each of the employability skills. One word to watch out for: During the scene where Chris is walking his son to daycare, his son asks him a question about the f-bomb. I encourage you to preview this movie so you know exactly where to hit the “mute” button to avoid this lovely word ! Students then complete the concluding opinion questions before turning in their chart for a grade. I like to have my students share their examples with the class. This can be done in small groups, whole class or even as a moving activity. Hang large pieces of butcher paper around the room with an employability skill heading on each one. Students circulate and write their example on the paper. When each skill and examples are referenced, students provide detail and explanation to their example. As a conclusion, have students go back to the human knot game and share how employability skills were utilized or could be utilized during the activity. You could also play variations of the game, showing how the skills used change. feedback@familyconsumersciences.com to be sponsored on this page. I know it is helpful to reference what others are doing to benchmark top programs. The class consisted of approximately 15 students, most of which were FCS teachers. 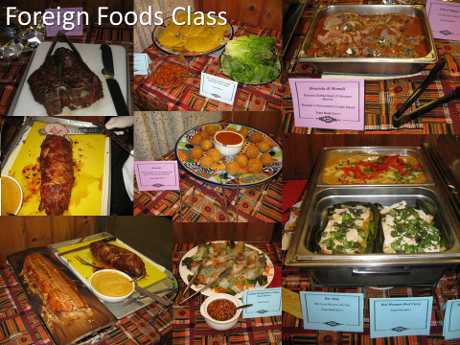 Class began with a lecture from Chef Siegel about the culture and customs of the country; this normally lasted till 10 a.m. 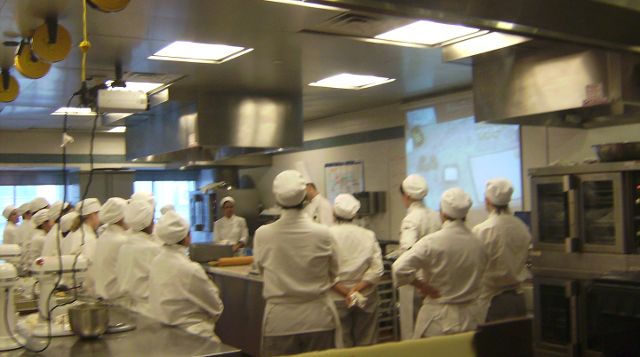 He would then give the class an overview about the meal we would be creating. On the first day, we were split up into 4 cooking groups. Each group was given a name having to do with each country we would be exploring. We were the Greek team “Oompas!” Each group was assigned a sous chef, who assisted with the recipes we were given and assembled our “mise en place” meaning needed ingredients. Monday, after the lecture, we made our way into the industrial kitchen, where Chef Siegel gave us a tour, pointing out the different areas of the kitchen: baking, soups and sauces, meats, salads, and short order meals, which was the main grill. After our quick overview of the kitchen, each person was given a recipe, and immediately started. There was a chaotic, but exciting period of rushing around, looking for ingredients and equipment needed for our different dishes. 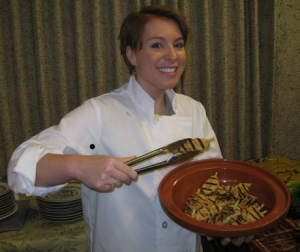 Intermittently, Chef Siegel, along with the other chefs in the kitchen would give demonstrations. Different demonstrations we observed were pasta making, crustacean cleaning, fish filleting, poultry cutting and butcher tying. At 12:30, each person placed their dish on the serving table, complete with garnishes, beautiful serving dishes and utensils. After we all enjoyed the amazing and unique meal, we would take turns discussing the dish each of us created and the class would give feedback. We would then go back in the kitchen, and finish cleaning. We were encouraged to clean not only our area, but take part in any cleanup in the kitchen that needed to be done. After the cleanup, we headed back into the dining/lecture room and learned about different cooking methods and food presentation techniques practiced in commercial kitchens and restaurants. Throughout the week, I prepared Greek fried chicken, poached fillets with white sauce, Tunisian briks, a meat, vegetable and egg mixture deep fried in a wonton wrapper, grilled shrimp puffs on sugar cane sticks and barbecued baked beans. I really enjoyed cooking with new, unique ingredients using cooking methods I was familiar with. Some of the recipes called for interesting cookware that are not used in the US. One of the pieces of cookware was a tagine, a Moroccan slow cooker used to make stews and other dishes. My favorite day was Friday, BBQ day. Sauces were made with ingredients that are favored by each state in the south. This class was so valuable for me in many ways. I not only got to learn about the cultures and foods from other countries, but I also got to cook in an industrial kitchen while interacting with many teachers from around the state. I acquired teaching ideas from them on other topics other than international cuisine. This class is by far the best, and most beneficial class I have taken since I started teaching. This is why students learn the most when they are having fun! For more information on this course and other courses offered by the University of Montana Missoula click here. To become an instructor you need to be a ServSafe certified manager first. To do this you simply need to take a class and pass the test. After you have been working as a ServSafe certified manager you can start the process of becoming an instructor/proctor. To become an instructor there is an online test that you complete at your own pace. The difference between the manager’s course and the instructor’s course is that the instructor has to know the how’s and why’s behind the regulations. The test is online and you can stop the test and go back later. The answers are not easy to find and require asking professionals or reading food law/codes. Once you have passed the online Advanced test you have to go through a presentation on what it means to become a dual role instructor/proctor. There are periodic quizzes throughout the presentation that you have to pass. The final step is to submit an application. The application asks why you want to become certified and requires professional experience. 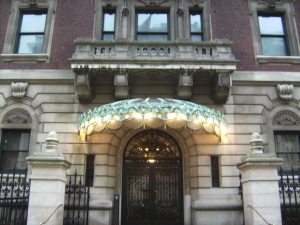 (125 West 18th Street between 6th and 7th Avenues). This was the 13th annual show and from the looks of the line wrapped around half a city block it was a huge success. To kick off the show every year, there is a famous chocolate fashion show. 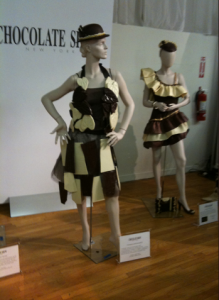 Outfits are made from chocolate and delicately walked down the runway. Although, I wasn’t there to catch the models trying to maneuver these heavy looking costumes, I did enjoy looking at their intricacies up close. There were lots of vendors to visit, chocolates from around the world to sample, and two different culinary demonstration kitchens where famous chocolatiers and pastry chefs show off their best chocolate secrets. I watched Nick Malgieri from the Institute of Culinary Education make a chocolate hazelnut tart (pictured below). I think my biggest fascination was not the chocolates themselves but how they were packaged and presented. It was interesting to find myself being drawn towards some booths more than other because their packaging was cooler and more appealing. Second to packaging, was the ability to try chocolates I wouldn’t normally choose to purchase. Usually when we don’t know whether we are going to like something or not we don’t take the risk to buy it. The nice part about going to the show was there was no risk in trying what I would normally pass over on the shelf. Some of the interesting flavors I tried were green tea from Japan, violet, lavender, cumin, chipolte, lemon grass, carmel apple, and spicy orange chocolate. 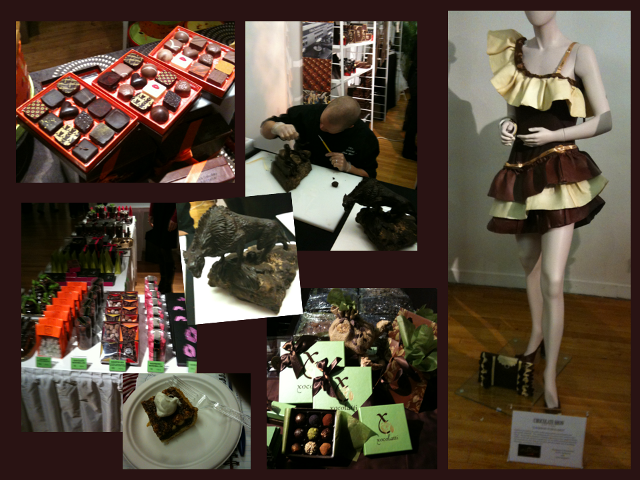 Besides how crowded the event was, it was worth a trip to the city to taste and see a whole new world of chocolates. 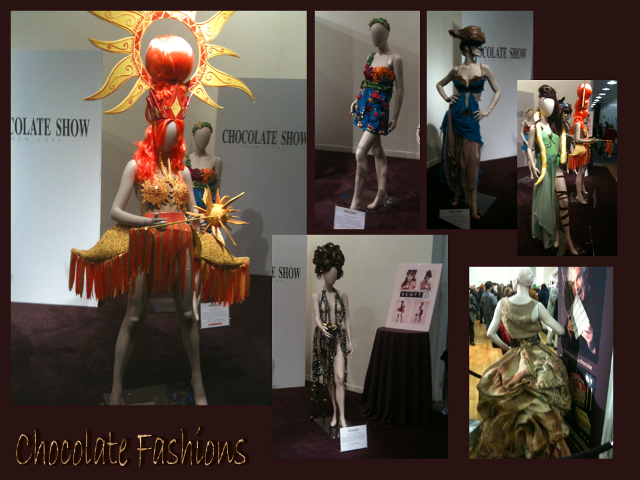 If you are interested in attending next year’s show, bookmark the chocolate show’s website and get tickets in advance to beat the lines. 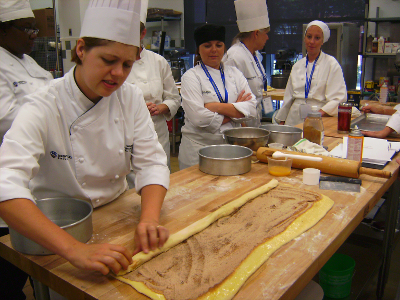 I learned so much at the Johnson & Wales Baking & Pastry Summer Educator’s Program. I described briefly what we did each day of the class. I also have included some products that were discussed and used during the class in case you cannot find them in your home state. Besides what is listed below, you’ll need the appropriate chef’s clothing and non slip shoes to be allowed into class. Day 1: The first class we introduced ourselves and went over what we were going to do each day. We started off by learning about the different ingredients and their functions in the recipes. The chef also demonstrated how to scale ingredients. Scaling ingredients means to weigh your ingredients on a baker’s scale. This is for accuracy in making large batches compared to say using volume measurements like measuring cups. Next we did a pound cake experiment to practice scaling ingredients and to see what difference certain ingredients make in the recipe. Each group was given a basic pound cake recipe with one ingredient they were to substitute. More details on the entire experiment are located in the Pound Cake Post. Next we made cakes and butter cream icing in advance so they would be ready for cake decorating day. We made fondant icing, basic butter cream, Italian butter cream, and Swiss butter cream. The difference between Italian and Swiss butter cream is the method of preparation. To make Swiss butter cream you heat the egg whites and sugar over a double boiler and you heat the mixture til the sugar dissolves and the eggs are 165F to pasteurize the eggs. To make Italian butter cream you cook the sugar with an acid (keeps sugar from crystallizing) to 250F and when the sugar is 235F you whip the egg whites and pour the sugar syrup into the egg whites really slowly. Day 2: On the second day we listened to a lecture on the fundamentals of bread baking. Then we made lean dough items like baguettes, epi, kaiser rolls, and focaccia bread. We also made at least one soft dough item like dinner rolls and sandwich loaves. We also made sweet dough items like challah, besting, cinnamon rolls, and brioche. Day 3: On the third day we learned basic cake decorating skills like making a smooth flat topped cake and lettering, and roses. Day 4: On the fourth day we made all the components of our platted dessert that we were going to serve during our “graduation” ceremony the following day. We learned that there are five components of platted desserts, the main item, sauce, crunch, frozen component, and garnish. We started by planning what we wanted to create by drawing our plates and getting feedback from the chef. For the main items, we made molded gingerbread, molten lava cakes, Bavarian cream, and chocolate mousse. For the frozen component we made French ice cream, fruit sorbet, American ice cream, and lemon sorbet. We also made fruit coulis, caramel, chocolate, and anglaise sauces. Lastly, our crunch components were almond lace and chocolate and vanilla tuile cookies. The chef demonstrated how to make some fruit garnishes like strawberry salsa, strawberry mountains, half raspberries, and sugared mint leaves. Day 5: On the last morning of the program we started by scooping our ice cream and sorbets into portions and putting them in the blast chiller. The chef had us wipe each plate with white vinegar before we assembled our desserts to be sure the plates were really clean and fingerprint free. We then assembled our plates by scribbling our sauce designs and un-molding our “main items.” The last thing to go on the plate are tuile cookies, which get soggy otherwise and of course the ice cream. After we ate lunch and received our certificates we went back into the kitchen and put the finishing touches on our desserts and served them to the culinary essentials class. We also used some special equipment that you may or may not have in your kitchen that is specifically helpful if you are teaching a baking & pastry class. Some rare things include a kaiser roll stamp, a bread scoring lathe, and a docker. If you teach culinary and have never been to Johnson & Wales’ Summer Educator’s Program you are missing out. I highly recommend attending if you get the opportunity. 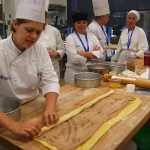 The J & W Summer Educator’s Program is professional development for vocational and FACS teachers who want to learn how to improve their skills especially working in a commercial kitchen. There are several programs. I happened to have taken the baking and pastry program but they also offer Culinary Essentials which follows their high school text book that goes by the same name. The educator courses are offered at all four of the Johnson & Wale’s campuses (Providence, Denver, Charlotte, Miami). Their course offerings change slightly every year so if you don’t see anything you would like for this year check it out again next year. They courses they offered this summer were Culinary Essentials, Baking & Pastry Arts I & II, Sustainable Food, and Culinary Nutrition. The pricing is $595 for the course and room & board, however travel expenses are not included. If you live near enough to NYC there are more than a few things to check out as far as Family Consumer Professional Development is concerned. 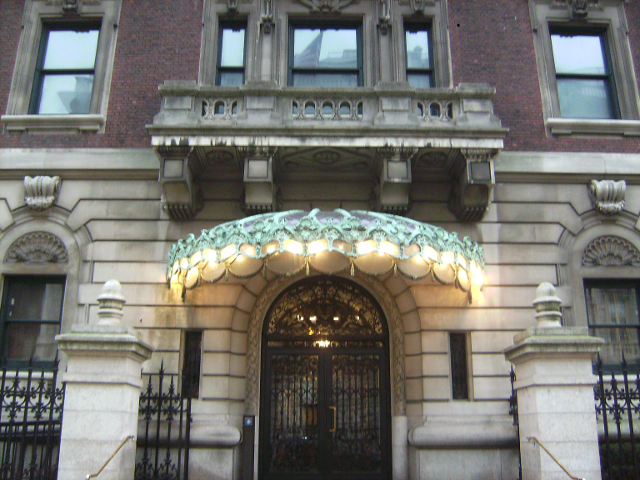 My favorite is taking a tour of the French Culinary Institute (462 Broadway New York, NY 10013-2618). 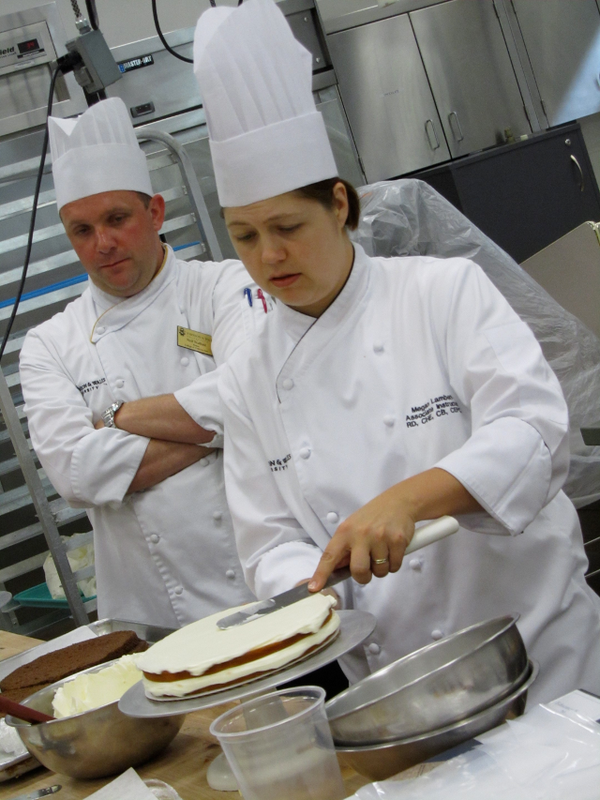 The French Culinary Institute is where Bobby Flay went to school which is neat in itself. The staff there are really personable and it is a great tour seeing their students in action through glass windows that allow for easy viewing of the kitchens. I happen to go on days when they were making wedding cakes and had chocolate sculptures on display. I have been twice, once to see the school so I could recommend certain students to go there and the second time I brought some of my students for a tour. The school is a culinary school not academic and culinary like Johnson and Wales so it appeals to a different type of student. They also offer one day classes to the public that could be professional development in itself. I think I am going to take one in chocolate or sugar flowers! Of course there is also the fashion district that has a ton of cool fabric and notion stores. 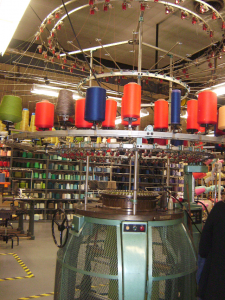 Imagine a two story building filled from top to bottom with buttons- breath taking! Along with fashion design you would be remiss to not visit the Fashion Institute of Technology (FIT) (seventh ave at 27th street). They have an on going free small museum exhibit but if your an educator who wants to recommend the school to students sign up for a tour. You can book a tour through admissions and you actually get to see the classrooms and students working. 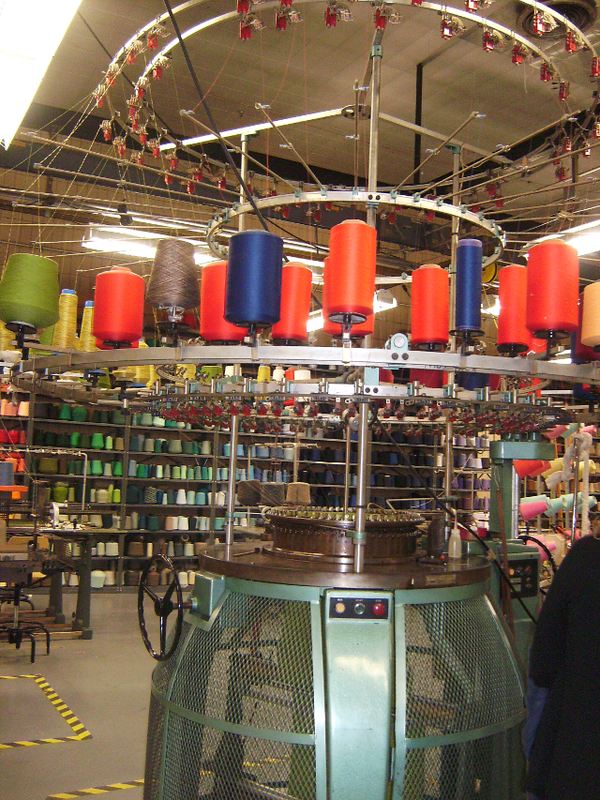 My favorite part of the tour were the looms where students could design and make their own knit fabrics.